In 12-inch nonstick skillet, heat 2 teaspoons oil over high heat. Add frozen vegetables; cook 4 to 5 minutes, stirring frequently, until crisp-tender. Divide vegetables among 4 dinner plates; cover to keep warm. Add 1 tablespoon oil to same skillet; reduce heat to medium-high. Add fish fillets; cook 3 minutes. Turn fish; spoon and spread 1 tablespoon peanut sauce over each fillet to cover. Cook about 4 minutes longer or until fish flakes easily with fork. 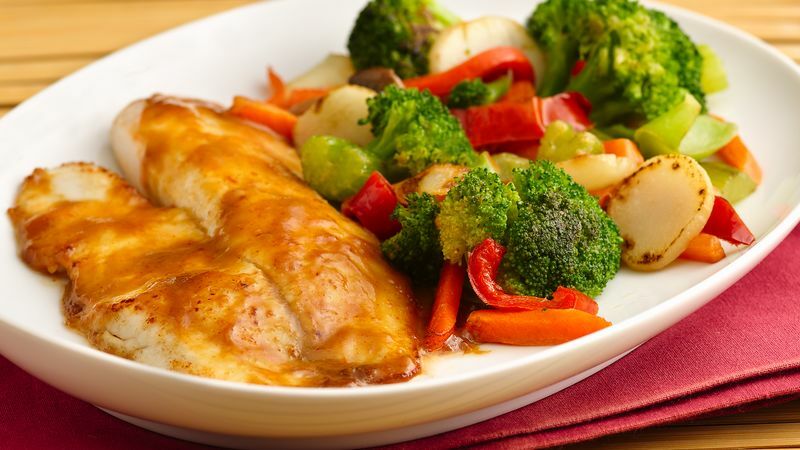 Serve fish with vegetables. If your peanut sauce is too spicy, use 3 tablespoons of the sauce and mix it with 1 tablespoon honey to tone down the spiciness. Any type of fish can be used. Several types of stir-fry vegetables are on the market; pick your favorite mixture.